The Silmarillion is a collection of tales by JRR Tolkien, edited and published after the author’s death by his son, Christopher Tolkien. The Silmarillion chronicles the history of Tolkien’s created world, from the “Creation” to the events leading up the “The War of the Ring”, the events chronicled in The Hobbit and The Lord of the Rings. The tales are a collection of writings whose concepts date back to as early as 1914, when Tolkien’s appears to have written some of the early drafts of his “Middle Earth Mythologies”. It was a labor which, as his son and editor Christopher Tolkien stated in the forward, “throughout my father’s long life he never abandoned…nor ceased even in his last years to work on” (TS pg. vii). The Ainulindale – “The Music of the Ainur ” – This part is a description of the “Creation” of Ea (the World) from the mind of Illuvatar (the One), resembling in many ways the Biblical Creation story. Valaquenta – “Account of the Valar and Maiar according to the lore of the Eldar” – The “Valaquenta” is a brief description of the Valar and the Maiar, two sets of “godlike” figures that rule over and assist Illuvatar in the creation of Ea. These figures are rather like a pantheon of “undergods”. They rule at and by the will of Illuvatar. Akallabeth – “The Downfall of Numenor” – Concerning the human island-kingdom of Numenor, its beauties, ambitions, and eventual downfall. Of the Rings of Power and the Third Age – Comprises a description of the events prior to and leading up to the events chronicled in The Lord of the Rings, including the conception of the Rings of Power; the coming of the Dunedain to Middle Earth; and the last alliance of Men and Elves. As mentioned above, the first concepts in The Silmarillion date back possibly as early as 1914/15. Certainly, some of the early manuscripts containing the “Lost Tales” of Middle Earth (as Tolkien often called them), date back to late 1916 and early 1917, when Tolkien had returned from World War I France with “Trench Fever”. Tolkien had several reasons for beginning this cycle of “mythological” stories. One was his love of language. He began developing a language (loosely based on Finnish), and realized that his created language was irrelevant unless he could create someone to speak it. Middle Earth was, he stated to his publisher in 1955, “fundamentally linguistic in inspiration” (Letters pg. 219). The stories themselves were meant to comprise something of a “mythology for England”, and were originally much more closely linked to English history and culture than they became in the end. In 1938, after the initial success of The Hobbit, Tolkien submitted an incomplete draft of The Silmarillion to George Allen & Unwin, his publishers, thinking they may have some interest in publishing it. The publishers found the text too obscure and dense, and asked instead for something more along the lines of a sequel to The Hobbit. Tolkien turned his attention to this, and the result was The Lord of the Rings, published in 1954/55, and generally considered to be Tolkien’s masterpiece. But The Lord of the Rings found itself straddling the line somewhere between The Hobbit and the earlier stories of The Silmarillion. It had neatly pulled the older world of The Silmarillion into the world of The Hobbit, merging the two. Thus the tales of The Silmarillion becomes the ancient background against which these two tales are told, creating “glimpses of a large history in the background” as Tolkien stated in a 1963 letter (Letters of JRR Tolkien pg. 333). After the publication and immense success of The Lord of the Rings in the mid-1950’s Tolkien returned to The Silmarillion with the intention of polishing and collecting the stories for publication. He worked intermittently on the text for the next fifteen years, but was troubled and slowed by some doubts about certain aspects of the stories. He was committed to making the stories as completely consistent with the already-published stories of The Hobbit and The Lord of the Rings as possible. Instead of working on the narrative and the tales themselves, Tolkien resolved to work out the minor issues he perceived within the text itself…unanswered questions that were bound to be asked, ideas which he had not fully developed. He later despaired that it would ever be ready for publication. JRR Tolkien died in 1973 with The Silmarillion still unfinished and unpublished. The demand for more books on his “created world” of Ea and Middle Earth was, however, greater than ever. Professor Tolkien’s son, Christopher Tolkien, undertook to organize and compile the narrative for publication. He found the manuscript very disordered an in some stages incomplete. Over the next several years he slogged through the remaining manuscripts and hammered out the single, cohesive narrative that is today known as The Silmarillion. Many of the unfinished tales, texts, and narratives – as well some of the stories in which there were earlier or divergent versions – that comprised the mythology were necessarily omitted from The Silmarillion and only published later as part of Unfinished Tales or the twelve-volume History of Middle Earth. 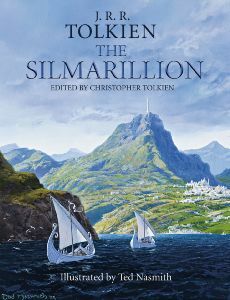 Because of the variance of The Silmarillion with many of the later-published tales, some critics have argued that Christopher Tolkien took unwarranted liberties with his own ideas and that The Silmarillion is as much a work of the son as of the father. Either way, The Silmarillion stands in its place at the root of the Tolkien canon, the soil from which the more famous tales of The Hobbit, and especially The Lord of the Rings, grew. I’m Linda Mark, the Founder of Moiche Review and also an affiliate. From my experience of a 9-years work on Clickbank,I do wish to provide you the honest review about Clickbank products. © 2019 - JRR TOLKIEN ONLINE. All Rights Reserved.